A gorgeous loaf, with a delicious crumb! This Maple Oat Skillet Bread is hearty, delicious and perfect for toasting, sandwiches, or eating with soup. Perfect for Fall! Yum! I’m so in love with bread making these days. There’s just NO smell like the smell of fresh bread baking, right? This Maple Oat Skillet Bread smells UH-MAZING when it bakes. The oats smell almost nutty, and it’s so hard to wait until the loaf is baked! (even harder to let it cool long enough to slice). There’s something so comforting about it, the smell, the taste… and the knowledge that you made this beauty yourself, right? 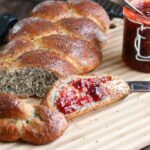 This bread is a solid family favorite – my youngest son, C, LOVES this for lunch along with some of my homemade strawberry jam and some peanut butter. This kid has no idea how great his life is. Homemade bread and jam? Heck yes!! This bread has less of a delicate crumb than plain white bread – you definitely get some sustenance out of just one 1 slice! It’s a little heavier, but because it’s packed full of oats, makes it better for you, and you need less to satisfy your stomach. The maple syrup is perfect with this too, it’s not overly sweet – and pairs perfectly with the oats. Ahhhh, fresh bread…. want a bite? I make this using a stand mixer, and I’ve made it using a bread machine – it just depends which appliance I can be bothered to haul out, really. It can be made by hand of course (and is brilliant therapy if you’re feeling angry) by kneading it yourself – but I love things that do the work for me, and leave me with more hands-off time. I like using a cast iron skillet to bake it too, because of the even heat distribution in the pan, plus it just LOOKS cool! Haha. Glad you asked! 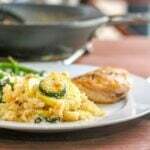 Very simple ingredients – you probably have them all RIGHT NOW! I do love having this stashed away, so that I can grab a slice or two to eat with a big bowl of soup for lunch or dinner. Let’s slice this baby up..
Get a little butter on it…. What are you most excited about for the coming season? Want more bread? Of course you do! A gorgeous loaf, with a delicious crumb! This Maple Oat Skillet Bread is hearty, delicious and perfect for toasting, sandwiches, or eating with soup. Yum! In a blender or food processor, add the oats, and pulse a few seconds. We want coarse crumbs, but not powder, so don’t overdo! Add the hot water to the oats, and mix. Let them stand until they cool to luke warm. Add the yeast, water, maple syrup, oil and salt to the pan of the bread machine. Add the warm oats and the flour, then start the machine on the dough cycle. When complete, remove dough from pan and turn out onto a lightly floured surface. Form dough into a smooth round loaf. Brush loaf with beaten egg, and sprinkle with the oats. In the bowl of a stand mixer fitted with a dough hook, add the yeast and warm water – let sit for a few minutes, then add the maple syrup, oil and salt. Add the warm oats and the flour, then mix to a soft dough (adding more flour if necessary). Grease a bowl, and add the dough to the bowl and cover. Let rise in a warm place until doubled in size. Punch down, then shape into a smooth round loaf. Place loaf in a cast iron skillet, cover with a clean towel – and leave somewhere warm until the loaf doubles in size, about 45 minutes. I’m so impressed this is made in a skillet! I have never baked a bread using s skillet. In fact, I never knew it can be baked that way. Thank you, now I know. The recipe looks delicious. Well….I LOVE making homemade bread…and using my cast iron skillet. This looks amazing, and I can already smell the aroma as it bakes. Perfect side to all the comfort foods that will be happening in the near future. Honey oat is my favorite bread. Your maple oat skillet bread sounds delicious, I bake bread never tried skillet bread. I think I need to try that bread’s crumb and crust looks delicious. Oh my goodness! I love the smell of freshly baked bread as it is but now you’ve gone and added maple to it. I bet that smells fantastic! You’re so right about the aroma of fresh baked bread making everybody drool and swoon! 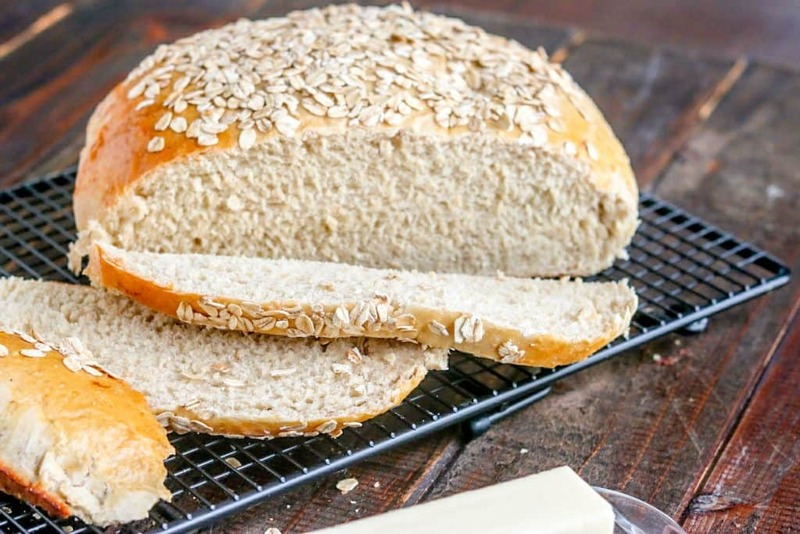 I like the rustic appearance of this bread with the oats layered over the top. I’m sure the maple flavor makes this good enough to eat a whole loaf! Ah, yes!! Homemade bread is the very best. Your loaf is beautiful and I really like the rustic touch of the oats on top. And I bet your son’s PB&J is the envy of everyone of his classmates. I collect bread recipes and I’m pinning yours. Love making bread. This bread looks so delicious! My husband often makes bread, so I’ll have to let him know about this recipe. Saving! I love baking and just recently I have started baking in a skillet. 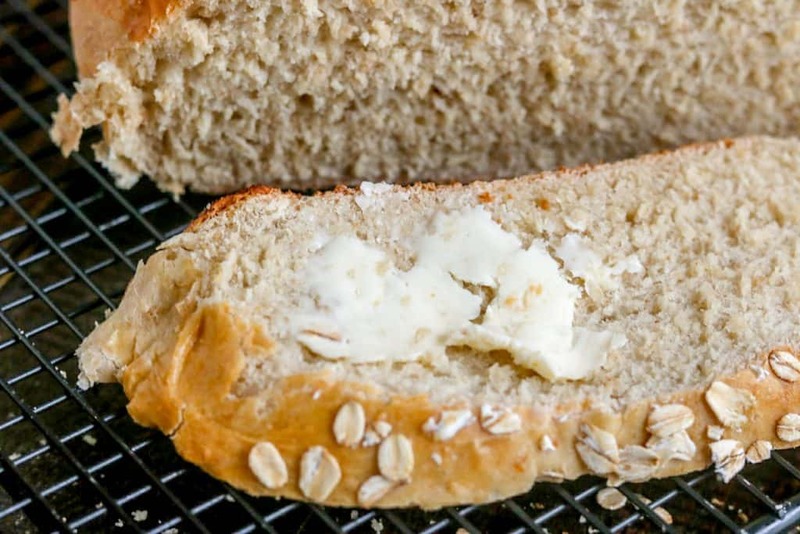 The honey and oats combination is the best ever and I am definitely looking forward to trying this bread. The bread looks so crusty and had a beautiful crumb. Gosh Kylee. I wish I felt about bread the way I do about cake! It’s always been my nemisis and I always avoid making it lol. Your loaf dies look amazing so rustic and I see you gave the instructions for a bread machine. I’m ashamed to say I have a bread machine that I got for Christmas about 5 years ago and it’s only seen the light of day a couple of times. May be it’s about time I faced my fears, your recipe looks easy. I’ll have a go next weekend? I love making homemade bread, but I don’t do it nearly enough. I love that you don’t really knead this dough! Those are my favorite ones to make. You could sit me down with this loaf, hand me a stick of softened butter, and I would be the happiest girl in the world. This looks amazing, and I can’t wait to try it. Oh my Lord!! I simply love him made bread and since I have visited new England, I am a sucker for anything with maple syrup 😉 I just know I will love this! Looks amazing Kylee! I recently just bought 2 different sized skillets too! Looks like a great reason to utilize them. 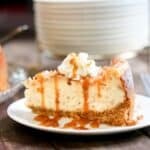 I would love a slice or two of this now!! This looks amazing! 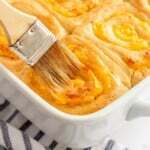 I love the round shape and the fact that it’s baked in a cast iron skillet. I need to sweeten more with maple syrup. I love the taste and I think it would be great in this bread. I made this bread into bread rolls. It is delicious! Soft and sweet with the flavor of maple syrup. It will pair beautifully with my cranberry sauce. Can I use a little grape seed oil for the top for the oats? I have an egg allergy. I love my iron frying pan. I actually have many…lol. Great bread. So delicious- not sure that the stated calorie count is correct for those of us watching what we eat. Nutrition will always vary based on brands and products used. This should only ever be used as a guide, you should always calculate your own!